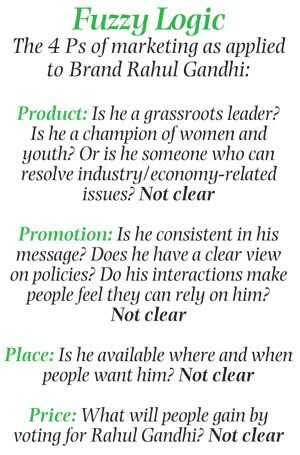 Why the selling of Brand Rahul Gandhi has not been a success so far. In 1999, Rahul Gandhi, then 29, accompanied his mother Sonia Gandhi to a Congress party rally in Hisar, Haryana. While the leaders sat on the stage, Rahul was a bystander, preferring to absorb the hustings' atmospherics. Barely was the rally underway, he was seen lifting a white plastic chair from the crowd and taking it to the stage for Kartari Devi, a Congress legislative party leader who was standing on stage. Empathy is a trait in the Gandhi scion that stands out strongly in his years in public life, but little else in the persona of Rahul, the politician, is clear. In a recent interview with Arnab Goswami, an incisive and loud newscaster, the Congress party vice president was forthright for most parts but that was about it. He came across as inexperienced, with a limited worldview in realpolitik, and as an interviewee lacking in panache, street smarts or the ability to steer a conversation his way - all important ingredients in the making of a politician brand. "What is Brand Rahul? The pitch is not clear," says Rasheed Kidwai, author and Sonia Gandhi's biographer, who was present at the Haryana rally, and has closely traced the journey of Rahul Gandhi as a politician . "In one-on-one he seems quite on the ball," says a well-followed communications expert, discounting a widely-held view that Rahul is a novice when it comes to getting his ideas across to the public. A Delhi-based brand consultant, requesting anonymity, describes Rahul as open to new ideas and somebody who comes up with ideas that may seem out-of-the-box but are well thought-out. Almost everyone BT spoke with among those who have worked with Rahul agrees there are layers and layers to the personality of the Congress leader. Rahul's ad blitz, said in some quarters to top Rs 500 crore in spending, has been written off already by brand experts as half-thought out, irrelevant, disjointed and late in its build-up. "They have successfully managed to keep the youth aspect alive but they are not playing it up enough," says image manager and Founder of Perfect Relations, Dilip Cherian. "He comes across as a young leader who is promising introspective change, while Modi is promising bigger and faster change." Another communications expert, Santosh Desai, says a brand is essentially "an idea that you deliver, which connects with people at a human level". He says the lack of a strong narrative makes the question 'What is Rahul Gandhi' difficult to answer. Rahul is trying to present himself as someone who is imagining a new kind of politics, a grassroot leader, a leader for women and youth. "These points are not coming across forcefully, the current campaign is context-less," adds the Managing Director and CEO of Futurebrands India. The groundwork and mechanics of building up a brand - in this instance, in the run-up to the general elections starting April 7 - has failed Rahul, too. The campaign kicked off only in December 2013, by when the Modi juggernaut was in traction in the public consciousness. Until then "Gandhi was busy campaigning in the states," says the Delhi consultant quoted earlier without name. It doesn't help that in a party steeped in dynasty, almost no one steps up to correct the younger Gandhi on decisions like the hour-long interview with Goswami of Times Now. Even today, few in the party will admit openly that the interview was a blunder. "At such a decisive time, it is unforgivable to do an 80-minute interview. Make it crisp, frame it, engineer it," says Desai. Rahul's sporadic outbursts come across as incohesive and often amateurish. Whether it is tearing up of the bill shielding convicted lawmakers and calling it "nonsense" at a press meet, or trying to push through anti-corruption legislation through an ordinance, it shows lack of experience and absence of understanding of how to navigate the system. There was also an opportunity for the Congress party to co-opt the Jan Lokpal movement. "It was an opportunity served to him on a platter. He made a last minute school boy intervention. That was a big mistake," says Desai. "You have to be consistent as a leader, you have to be predictable... the most difficult thing is to follow an unpredictable leader," says Pradeep Kashyap, Founder of MART, and an established rural marketing veteran in India. "Every time he has come forward it has seemed like a knee-jerk reaction." When compared to Modi, who has his track record in the state of Gujarat as administrative credentials, Rahul has little to show for the work he has done in the last 10 years, except changes he has brought about within the Youth Congress. "Where is his success story," says Kidwai. 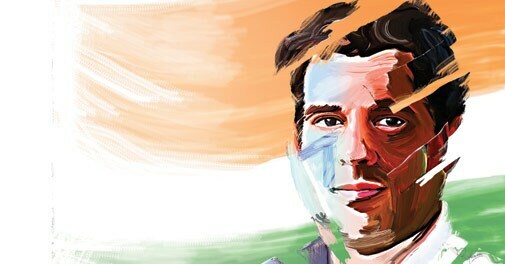 Rahul's father, the late Rajiv Gandhi, "was younger than (Rahul) when he became Prime Minister. He was a professional with two children. And, while he was initially reluctant to take on the mantle, Rajiv Gandhi took no time in rolling up his sleeves and getting down to work," says the Sonia biographer. Rahul's absence from the party office and patchy participation in Parliament debates don't go down well with the younger cadres of his party either. Strangely, Rahul, a technology enthusiast, is not on social media and a petition floated by 'Friends of Congress' requesting him to join Twitter has gone unheeded. In doing so, he has squandered opportunities that could have given voters a glimpse into his thoughtprocess and avoided publicity goof-ups. For instance, Rahul had no clue about Congress leader Mani Shankar Aiyar's jibe at Modi's early days as a tea seller at a party meet in Jaipur in January until three hours after the controversial remark. Aam Aadmi Party's brand carefully engineered by its leader Arvind Kejriwal shows up the opportunity missed by Brand Rahul. Kejriwal created a brand out of almost nowhere in a year with a clever choice of brand props. "It's a powerful idea brought to life by everything the party does - its symbol, Jhaadu, to its caps," says Desai. Jhaadu is broom in Hindi. Kejriwal gets photographed with sweat beads on his face to deliver the message of him being a doer. Modi's pictures project an authoritarian figure. Rahul's image is less unambiguous - he has not been able to shed his baba image. In Hindi, baba, used in this context, refers to the young born into rich and influential families. To be sure, Rahul has been holding meetings with small groups of porters, women, rickshaw pullers and students across the country giving out the message that he is a leader who doesn't talk down from a podium. His overall strategy of projecting that he was never in power and is an outsider is flawed because it does not account for his lineage, say brand experts. Much of Rahul's problems with his brand can be traced to his being an introvert because of which he has not been able to make the connect with his audiences. "By nature, Rahul tends to be very private and he is most collegial with people he is close to and that's a small group," says Cherian of Perfect Relations. In contrast, Modi, who is holding similar conversations, branded 'Chai Pe Charcha', plugging into Indians' fondness for tea while subtly reinforcing the BJP leader's climb from modest beginnings, instantly grabs the attention of people, whether they agree with his politics or not. Congress insiders promise the next stage in the Rahul and party campaign will be more focused in its messaging and tailored to specific target groups. Meanwhile, Brand Rahul seems to be stuck in a vortex of legacy, what he wants to be, and what his party and spin doctors want him to be. The evolution of a definitive brand, it seems, may be a tad late in the making for this general elections. "Rahul Gandhi is a product that is making a claim that I am in R&D mode," says Sunil Alagh, Chairman of SKA Advisors. "Modi is a chai-biscoot man, part of our daily life. Rahul Gandhi is a chocolate biscuit brand - and I don't need chocolate today."